The Best Open Mic in Green Bay! Augie has been hosting open mic at IQ's every Wednesday for about 2 years now and you can tell he has this down to a science. Ever since the first time I saw Muddy Udders live and I learned the 1/3 front man of the band hosts an open mic down at IQ's bar it has been on my mind that I have to get down there. Well last night I did! 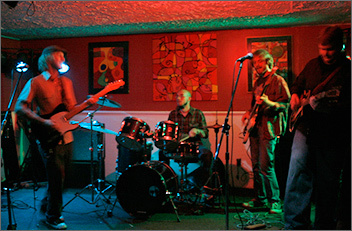 I wanted to write about this from firsthand experience so I dusted off my Danelectro electric guitar, called my friend Travis who I knew was a drummer even though we have not played together, and we set our sights on IQ's open mic. I got there a little early to chat it up with Augie for a bit and get our band on the list. Augie let me know that we would get enough time for two songs, but no more because there is an anonymous talent scout in the bar this week and he wants to give as many people as he can a chance to shine! Augie has been hosting open mic at IQ's every Wednesday for about two years now and you could tell he has this down to a science. Travis showed up so I helped get the drum kit and amps out of the car. Then the rest of Muddy Udders showed up so we helped them unload their gear as well. A few minutes to get things situated on the stage and Augie was off to warm up the crowd with some plucking on his acoustic, Matty got situated on the bass, and then Augie calls out while playing the song "we could really use a drummer right about now!" A couple of seconds go by, I look over at Travis and I said "Dude Go!" Without hesitation Travis runs up on stage, gets on the kit and lays down the back beet! It was really cool and that led to allot of the performers asking him to sit in and play drums for them! It was great to see the variety of really talented players at all different levels just jam out! The bar was packed for a Wednesday night and the patrons were extremely welcoming and encouraging of the guest musicians. Then it was our turn to shine on stage. Now I haven't played in a band or been on stage for anyone in about four years so was a little nervous about tanking tonight, to add to those nerves was the first time I ever seen Travis with a pair of drumsticks. I took a deep breath, did the "Here goes nothing thought," and gave it my best. Augie jumped in to play bass making us a three piece on stage. 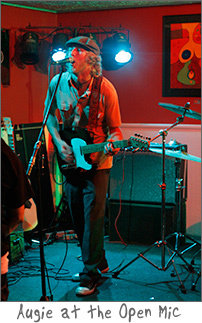 We played a couple of blues rock tunes I had written with my band in Madison. Well it wasn’t a total disaster and it was so much fun! Muddy Udders even got up to lay down a couple of songs, one of which is coming out on their new Album, check the video! The music went deep into the night and it was one musician after another after another. Lots of Blues, Jam, Folk, and it all sounded good to me! IQ's is holding a special open mic this Saturday at the request of the talent scout. If you play be sure to get down to IQ's and get noticed and if you don’t play, but just want to watch, there will be plenty to see and hear.